People love taking breathtaking photos from iPhone camera. The most beautiful photos comes where the subject doesn’t know that photo is being taken by someone. It’s because natural appearance comes into effect which is more good for pics. Most of the phone cameras make sound while taking photos. iPhone/iPad camera also makes shutter sound while taking photos. If shutter sound comes then people know that you are taking photos. They will become more conscious to look good on camera. The natural thing will be gone. That’s why it’s required that iPhone camera sound doesn’t come at all. You can easily mute iPhone camera sound. It doesn’t matter whether it’s iPhone X/8/7 or iPhone 6. There are 3 settings through which you can mute camera sound of iPhone/iPad. You can take natural pics by disabling the shutter sound in iPhone. There are many countries like Japan and South Korea where you can’t mute camera sound in any phone. It’s because of the privacy issues. Many people take random pics by removing camera sound. They may take picture of others which is not considered very good in many countries. You are violating their privacy by not taking their permission before taking pics. In order to avoid such situation, it’s been mandated by government of these countries that iPhone or any other phone camera shutter sound must always be ON. You can’t change the settings internally or any other app to remove shutter sound. Follow below methods to turn off camera shutter sound completely in iPhone. You can try this method on iPad as well. It works perfectly. The simplest way to turn off camera sound in iPhone 6, iPhone 7, iPhone 8 and iPhone X is to use the Ring/Silent switch. It’s also known as Mute switch. You can find the mute switch at the top left of the iPhone. You move either up or down. So if you camera is making sound then it’s in the UP position. Simply put it down. It turn down volume of your iPhone completely. You will get a notification on your iPhone screen whenever you will move the switch in UP or DOWN position notifying you that it’s turned on. You need to know that it will turn off camera sound, sound coming from notifications, alerts, incoming calls and any other alerts on your iPhone. When you camera work is done then you need to switch it back in ON position. Don’t forget or you will miss important notifications and incoming calls on your iPhone. The second way to shut down camera shutter sound on iPhone X/8/7/6 is to turn the volume down completely. Use the volume buttons. Turn the volume down till you see sound icon with a cross mark on it notifying that volume is completely turned down on your iPhone. It should be done before taking any pics from iPhone camera. If you will try to bring down the volume after opening the camera then you will start taking pictures in burst mode. Turn down volume down on iPhone to remove shutter sound. You can also turn volume completely down from control center. Open the control center from the bottom of the iPhone. Slide to the left to open the volume option. Slide the volume slider at the bottom. Now you can easily take pictures without anyone noticing. Most of the high end iPhone starting from iPhone 6S, iPhone 7, iPhone 8, iPhone X, iPhone XR, iPhone XS and iPhone XS Max can take live photos from camera. If the above method didn’t work for you then you can apply this method to turn off camera sound while taking pics on iPhone. You need to turn ON the Live Pic feature on iPhone camera. Whenever the live pic feature is turned on then iPhone camera doesn’t make any sound. It works perfectly on every phone. Turn on the live pic mode and shutter sound will go away. Try out this feature. Final Conclusion: If one of the above methods don’t work out for you then you live in a country which doesn’t allow camera sound to be turned off due to privacy issues. You should first confirm that. We have tried and tested the method on iOS 11 and iOS 12 and it works perfectly. This entry was posted in iPad Wi-Fi Settings, iPhone Settings, iPod Settings on March 29, 2019 by satyenhacks. Offload unused apps is feature given on iPhone/iPad. You can enable/disable “Offload Unused Apps” on your phone depending upon your need. We keep installing so many apps from time to time which are required at that moment. We continue to use those apps and games over a period of time. But at one point to time, we rarely use them. We get engaged with other more useful apps from app store. Those apps remain on our iPhone/iPad. We don’t delete them. Whether it’s me or you, we don’t count number of days of not using those apps. “Offload unused apps” feature does that for us. Offload Unused apps knows about all apps and number of days of not using them. If it’s enabled then it will remove those apps for the time being to increase your iPhone/iPad storage. You can reinstall the app whenever you want it. One of the main point of this feature is that it keeps all the settings, data and documents of the app being deleted. If you manually remove apps then it will delete everything. However Offload Unused Apps feature will keep user data on iPhone/iPad even after removing the app. Follow the below step by step instruction to disable/enable offload unused apps on iPhone 6, iPhone 7, iPhone 8, iPhone X, iPhone 5, iPhone XR, iPhone 6S, iPhone XS and other models having iOS 11 or higher. Open “Settings” on your iPhone/iPad. Scroll down and tap on “iTunes and App Store” option. You will see “Offload Unused Apps” option at the bottom. You can enable/disable it from there. If it’s showing “Green” colour then it’s enabled. If it’s grey then disabled. If you don’t want to remove any apps or your iPhone keeps deleting apps without your consent then disable the offload unused apps feature. If you want to save storage on iPhone/iPad then enable it and let the feature do the rest. Whenever deleted app is required then you can reinstall it and data will still be there. Tap on “iPhone Storage” option. You will see the option for “Offload Unused Apps”. Enable/Disable will be also be written in front of it. It will also show you the total MB of space that you can save by enabling the feature. Simply tap enable/disable to whatever you want. How to Offload a Single Unused App on iPhone/iPad? Many people don’t want all apps to remove from their cell phone. In such case you have the option to offload a single app as well. It will save all your data and documents and remove the app to save storage space. Suppose you don’t want to use Youtube for upcoming days and you want to have more storage space on iPhone/iPad for that period. Then you can use below step by step instructions to offload single apps from iPhone/iPad. Go to “Settings” of iPhone/iPad. Scroll down and find “Youtube” from the list of apps that you see or choose whatever app that you want to remove. Tap on that particular app. You will see “Offload App” option in the middle. Tap on it and let it do the rest for you. You can reinstall whenever you want and you will get your previous data and documents of the app back on. Final Conclusion: These are the best 2 ways to Enable/Disable Offload Unused Apps feature on iPhone/iPad having iOS 11/ iOS 12 or higher version. It’s a great feature to save some space on your phone. Use it wisely. This entry was posted in iPad Wi-Fi Settings, iPhone Settings, iPod Settings, Uncategorized on March 29, 2019 by satyenhacks. People are too much confused regarding reset network settings options in Android and iPhone/iPad. There are basically 3 options in every phone. Reset settings, Reset all settings and Reset network settings are 3 options which you can use for different purpose. Reset settings is a soft reset where your data doesn’t get deleted but settings are reset. Reset all settings option makes your phone go to factory settings. It will wipe data like photos, videos, documents, music and all settings. All call settings will reset. All bluetooth settings will reset. It will also delete any saved Bluetooth devices. You have to again pair bluetooth devices. All Wi-Fi settings will reset. It will also delete saved networks, passwords etc.. Try to save network name and password somewhere before you perform reset network settings on your iPhone/iPad or Android. Reset Network Settings will also remove Wi-Fi issues like “WiFi wont turn on, Wifi won’t connect, IP address unavailable, IP address conflict, authentication error, Saved secured but no internet, connected but no internet etc.. Once you perform reset network settings on your Android/iPhone, most of these problems will go away and you can browse internet from wifi without any problem. VPN connection settings will also reset. It will delete all saved VPN connection settings. You have to configure it again. These settings work same for Android device and iPhone models such as iPhone 6, iPhone 7, iPhone 8, iPhone X, iPhone XR/XS/XS Max and similar ones. It also works same for iPad. So if you are experiencing problems related to call settings such as “No service” or “Searching…” for mobile network then you can perform reset network settings. If you are experiencing problems related to Bluetooth settings such as “Bluetooth won’t connect to Android”, Bluetooth device won’t pair, bluetooth pairing code problem, device connection issue etc… then perform reset network settings. Pair your bluetooth device again once phone restarts. If you are experiencing problems related to Wi-Fi or Hotspot connection issues such as Authentication error, connected but no internet, IP address unavailable, IP address mismatch, Saved secured but unable to connect, wifi wont turn on, wifi won’t connect then perform reset network settings on android/iPhone. It will fix these issues. Connect to your favorite network once again when phone restarts. Try to remember your network and password or note them down somewhere if you perform reset. VPN settings are also related to internet so they will also be wiped off. You can reconfigure that as well. Hopefully this will clear all the doubts in your mind. One thing you need to remember is that “Reset Network Settings” won’t delete any data such as photos, music, videos or documents. It simply resets the Call, Wi-Fi, Bluetooth and VPN settings of your phone. If you still have any doubt then please comment below so that I can clear for you. Don’t forget to watch the video and subscribe to my channel. This entry was posted in Android Settings, iPad Wi-Fi Settings, iPhone Settings, iPod Settings, Wi-Fi Connectivity Issues and tagged What Does Reset Network Settings Do on iPad 2019, What Does Reset Network Settings Do on iPhone 6, What Does Reset Network Settings Do on iPhone 7, What Does Reset Network Settings Do on iPhone 8, What Does Reset Network Settings Do on iPhone X, What Does Reset Network Settings Do on iPhone XR, What Does Reset Network Settings Do on iPhone XS, What Does Reset Network Settings Do on iPhone XS Max, What Happens If I Reset Network Settings, What Happens If You Do Reset Network Settings on Android, What Happens If you Perform Reset Network Settings on iPhone 6 on March 21, 2019 by satyenhacks. You newly bought Airpods are not connecting to your Macbook and you have no idea why. You must have tried all the possible ways to make the Airpods get connected to Macbook so that you can listen to your favorite music wirelessly. If your iOS devices are linked to the iCloud account then Airpods will pair quickly with them without any problem. However not all things go as shown in launch videos. Right? Keep reading the methods to know why your Airpods won’t connect to your Macbook. There can be multiple reasons behind Airpods not connecting successfully with Macbook. The reasons can be charging problem, Bluetooth pairing problem, Airpods as output device problem or may be it’s the charging case of the Airpods. You need to make sure that your macbook is running the latest MacOS. The latest operating system for Macbook is MacOS Sierra. If you don’t have latest OS in your Macbook then Airpods won’t connect for sure. Update your Mac now or just check whether it has the latest OS. To Update: Click on the Apple logo at the upper left hand corner of mac screen and tap on About This Mac. A popup will appear when you will click on on about this mac. Tap on software update to update the MacOS if it doesn’t show MacOS sierra. Turn ON Macbook Bluetooth – To connect any bluetooth device to your Macbook then bluetooth should be turned on. Go to System Preferences >> Tap on Bluetooth >> Turn ON Bluetooth. Your Macbook will say “Bluetooth ON” when it’s turned on. Bluetooth can also be turned on clicking on bluetooth icon in the upper right hand corner of macbook. It will be black when turned on and grey when turned off. Tap on Bluetooth icon and tap on “Turn Bluetooth ON”. Put Airpods into charging case and keep the lid of case open. Press and hold the setup button which is at the back of the charging case. When bluetooth pairing mode is turned ON then status light will flash white. Open charging case of Airpods. Go to System Preferences >> Bluetooth in your Macbook. Make sure the Bluetooth is turned ON for your Mac. In the devices list, double click Airpods. Now Airpods will get manually connected to Macbook. Note: You can also get manually connected to Airpods by clicking the Bluetooth icon in upper right corner of mac and then selecting Airpods to get connected. Forget Airpods as Bluetooth Device – Sometimes Airpods don’t get connected even when you manually click on Airpods from the list of bluetooth devices. It may be due to some technical reasons. In order to make things work, you can forget the Airpods from the Bluetooth device list and then try to get connected again just like first time. Follow the steps given below to forget Airpods and list it freshly in bluetooth devices list. Select Airpods from list of device and click on X in front of it. Click on “Forget Device” when any alert appears. Now try to reconnect Airpods to Macbook after sometime. Most of the time this method works perfectly and Airpods get connected successfully. 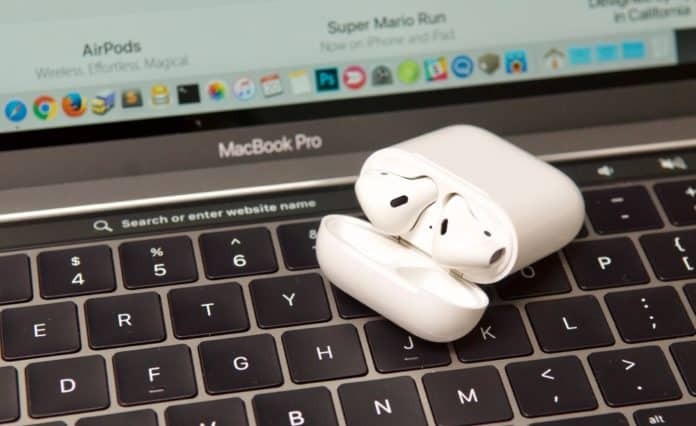 Airpods as Output Device – Whether you know or not but you need to select output device for the sounds produced by Macbook. Macbook is smart enough to detect headphones, speakers and such things and changes the output device accordingly but sometimes due to technical reasons it doesn’t get changed. It causes problem for the person. You may think that Airpods are not connecting properly to Mac however output device didn’t change in actual. You can fix it by selecting Airpods as your output device in sound settings. Make sure Macbook Bluetooth is turned on and Airpods charging case is open. Go to System Preferences >> Click Sound >> Click on Output tab. Select Airpods as the output device and test it by playing some music on mac. In case you don’t see Airpods then first connect it to Mac using Bluetooth. Charge Airpods charging case and Charge your Airpods – The charging case that comes with Airpods has an inbuilt battery inside it. You need to make sure that it’s charged from time to time. It can be charged with or without Airpods. You also need to charge Airpods. Enough battery is required on Airpods to function properly. A low battery will cause issues while connecting with your mac. Put your Aipods in the charging case to charge it. Green Status Light – Airpods are fully charged. Amber Status Light – Less than one full charge. White Flash – Airpods are ready to be connected to one of the bluetooth devices. Check for Debris in Charging Case – You should check for dust and debris in the charging case and Airpods. If there is debris in the charging case then it will create problem in Airpods charging. We normally see debris being present in iPhone charging. We need to carefully clean it up for proper functioning of the device. Press and hold setup button on charging case. Release button when status light flashes amber few times and then white. It will reset your Airpods and you can now connect with your mac without any problem just like first time. Repair your Airpods – There is always a chance of hardware issues. In such cases you need to get your Airpods checked at authorized Apple service center. If Airpods are under warranty then get them replaced as soon as possible. If they are repairable then someone there will surely fix it up for you. There is 1 year warranty available for Airpods. After trying all the above things, hopefully you will get easily connected to your macbook for listening to your favorite music and watch videos. If you are still having difficulty in connecting after trying all 8 methods above then go for 9th one fast and get them replaced. This entry was posted in iPod Settings, Macbook Settings on July 26, 2018 by satyenhacks.